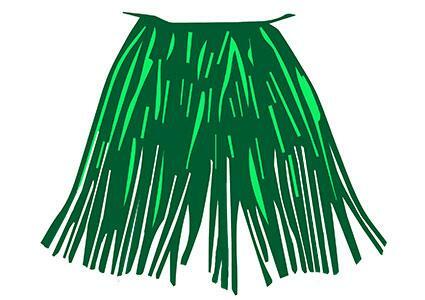 Click to download the hula skirt instructions. Whether you're planning a luau party, or your kids just want to get into the spirit of things before the next cookout, consider doing some luau-themed crafts. From hula skirts to paper flip flop decorations, there are crafts to keep kids of all ages occupied. If you need help downloading any of the printable instructions, check out these helpful tips. No luau party is complete without the proper luau attire. Let kids outfit everyone at the party by setting up a hula skirt making station. Cut a large piece of green yarn to fit around each child's waist. Have kids cut long strips of green construction paper. Fold the paper over the top of the yarn and staple. Continue stapling strips until only a few inches are left on each side (enough room to tie the skirt). Take scissors and split each strip into smaller cuts to make the skirt more "grassy." Tie the finished skirt on each child. 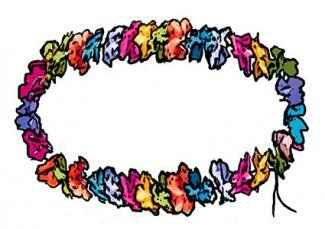 Create some fun leis to go along with the hula skirts. Once they're made, kids can have additional fun decorating each guest that comes through the door. Click to download the lei instructions. Locate the center of each silk flower or flower petal and punch a hole in it with a hole punch. Cut a piece of yarn to approximately 18 inches in length and thread the flowers or petals onto it. If using individual petals, turn the petals as you thread them so they overlap one another in different directions, simulating real flowers. Tie the two ends of the yarn together at the top and trim off the excess yarn. Make some luau-themed winsocks that can be hung around the party for decoration or taken home for a fun souvenir. Click to download the wind sock instructions. Punch four holes down each side of the short ends of the foam sheet. Bend the sheet into a tube and push the brass fasteners through the holes. Bend the prongs on each of the fasteners backwards to secure the tube. Glue some foam flowers onto the exterior of the tube. Try stacking different colored flowers on top of one another to help vary the effect. 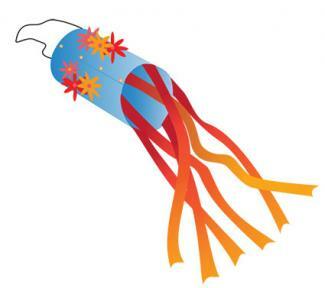 Cut the paper streamers to about 24-inches long and glue them to the inside bottom of the tube, allowing the them to trail downward. Cut a piece of string about 18-inches long and glue the ends to the interior of the top of the tube to make a loop it can be hung from. Allow the glue to dry before hanging. These fun paper flip flops can decorate the party, or your kid's bedroom once the party is over. 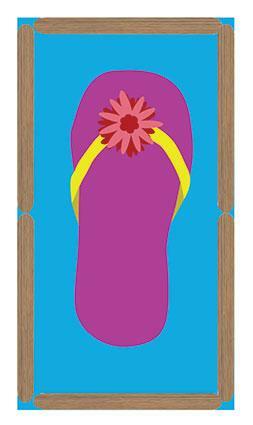 Click to download the paper flip flop instructions. Cut a piece of construction paper in half. Glue craft sticks around the edge to form a frame. Take a second piece of construction paper in a contrasting color from the first. Have your child loosely trace the shape of her foot onto the paper and cut out the resulting shape. Cut a piece of ribbon about eight inches long and glue it horizontally across the middle of the framed paper. Set the foot-shaped paper down on top of the ribbon so the ribbon comes out on either side. Glue it into place. Gently pick up each end of the ribbon and pull the ends up and toward the front of the flip flop where the toe would be located. Glue the ends down to the paper, pulling the rest of the ribbon up so it appears to be arching up from the flip flop down to the toe. Glue a small flower onto the ends of the ribbon to adorn them. Luau crafts are a fun addition to any kids' party. Create some decorations or some fun things to wear home to help make your party a success.